Description: Slender perennial with long rhizome. Culms rigid, terete, 1–3-noded, striate, glabrous, smooth, 20–90 cm high, 1.0–2.0 mm diam. Leaves basal and cauline; blade reduced to short erect flattened mucro; sheath straw-coloured to pale reddish or grey-brown, dull. 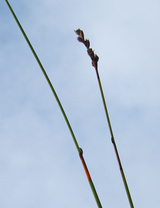 Inflorescence oblong to ovate in outline, narrow, erect, 1–8 cm long, to 1 cm diam. ; lowest involucral bract shorter than inflorescence. 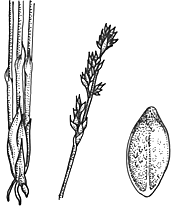 Spikelets few, 1-flowered, 3–6 mm long. 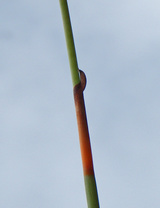 Glumes 4 or 5, acute to long-acute, red-brown to grey-brown, with margins glabrous, midrib scaberulous; fertile glumes 3–5 mm long. Anthers 1.8–2.2 mm long, excluding appendage 0.3–0.5 mm long. Nut obovoid to globose, 2.3–3.0 mm long, 1.5–2.0 mm diam., smooth with scattered pits, hispid at apex, shining, dark red-brown to black. Distribution and occurrence: Grows in mostly brackish or saline swamps, on sandy soils; in coastal areas except for isolated occurrence at Boonoo Boonoo Falls. Other Australian states: Qld Tas. W.A. S.A.